Rugby League: Another 10 minutes and the Mackay Cutters would probably have ended round 6 with two more competition points. Instead, Steve Sheppard's side were left two short against the Tweed Heads Seagulls in their Intrust Super Cup encounter at BB Print Stadium on Saturday night. Playing with a gale at their backs for the opening 40 minutes, the Seagulls took advantage to lead 14-2 at the break. 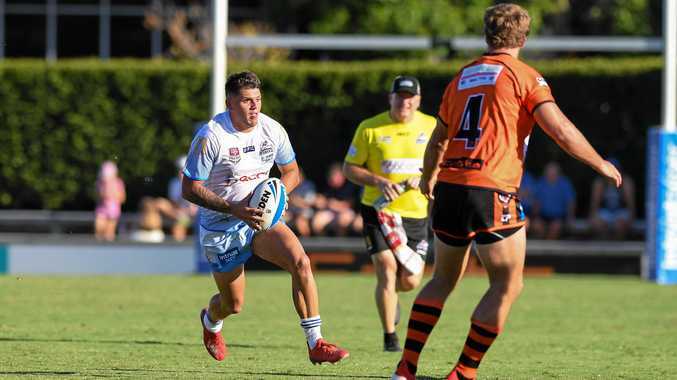 Gympie's Cowboy Carlin Anderson returned to his fullback position and sailed the conversion attempt wide and the Seagulls held firm in defence for the final 10 minutes to upset a vocal home crowd. Sheppard was impressed with the defensive solidarity of his side, but lamented some poor last-tackle options which left points on the field. "I thought when we got to the crucial stages and crucial times we probably took the wrong option,” Sheppard said. With five-eighth Lloyd White already missing, the Cutters were forced into another reshuffle when skipper Cooper Bambling left the field. Sheppard said the lack of an established halves pairing was a big factor in the Cutters failing to capitalise on their field dominance in the second half. "I thought Ryley Jacks for them, he just kicked them into corners (and) found touch when he wanted to,” he said.